The Brian Nicholas oozing onto and smoothly navigating the lugubrious waters of an urban waterway called the Newtown Creek. Some 75 feet long, with a gross tonnage of 104 GRT, the Brian Nicholas is a creature of DonJon towing whose motive power is supplied by 2 850 HP engines that was built in 1966 and retrofitted in 2010. This past June, Donjon completed the top-to-bottom refit and replacement of the main engines, generators, gears and related equipment of its tug Brian icholas. The refit was performed in house at Donjon’s Port Newark, New Jersey facility under the supervision of Donjon’s Gabe Yandoli and Robert Stickles. 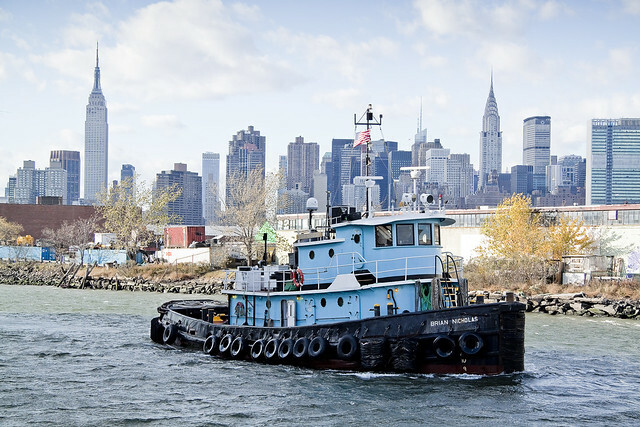 As a result of the refit, the Brian Nicholas is now a “green” tug, compliant with all applicable EPA and Tier 2 marine emissions regulations. The rebuild included a repowering of the main propulsion with Cummins K38-M Marine engines, which were specifically developed by Cummins to meet EPA and Tier 2 marine emissions regulations. The new engines also meet the IMO, MARPOL and EU Stage 3A requirements. Similarly, the generators were upgraded to incorporate John Deere 4045TFM75 engines, also Tier 2 compliant. In addition to the replacement of the aforementioned engines, the project required virtually total replacement of exhaust lines and routing of new control lines and panels in the engine room and wheelhouse.